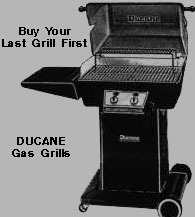 *5 Year warranty on briquettes, painted galv-alum base, optional side cooker insert and optional full-length cover. All other items covered by limited lifetime warranty when you return warranty card within 30 days of purchase, along with check for $15. Fee covers historical data entry and lifetime retrieval. Offer applies to original owner only and is not transferable. WARNING: BE SURE TO HAVE YOUR LP PROPANE TANK FILLED BY A REPUTABLE DEALER. AN INCORRECTLY FILLED OR OVERFILLED LP TANK CAN BE DANGEROUS, LEADING TO PERSONAL INJURY OR PROPERTY DAMAGE. Index | Newsletter | To The Grill!